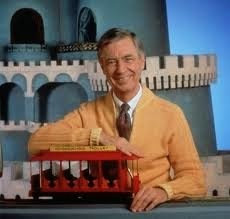 I have decided to break down the "Behind the Scenes" making of my Mister Rogers Neighborhood living room miniature into separate posts. This one is focussing on the making of the miniature trolley. This was one of the smallest things I have ever made, but one of the most magical little things to hold. Of course everything begins with a design. Here is the scale drawing I did based on the actual trolley itself. I did not have the plans or dimensions so I used pictures to and video footage to scale it myself. 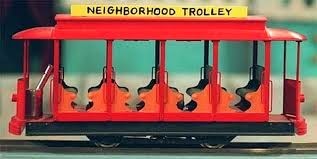 Here is a shot of the actual Trolley from the television show. I used this picture as a reference for the scale of the trolley miniature itself. I started the miniature with a base made of balsa wood. It's lightweight and easy to manipulate. You can see below the scale on the cutting mat is in inches. The trolley itself is only 1-1/2 " long. Next I created the walls to divide the trolley seats. I use white glue and crazy glue for all my models, depending on the job. I used tweezers to put things into place. I have a pair of tweezers that also have a magnifying glass on it. Very useful. The seats begin to take place. Although I feel it may be a bit crowded or maybe the seats are a bit too deep, I usually just go with the flow. I also use thick card and regular paper to create walls and exteriors. So hard to cut. I wish it was easier to cut such small patterns, but I learn as I go. I found that different wire gauges are useful for the posts. One is a thin craft wire and one is a thread wire. Here you can see the card in place as the front. Here you can see wire and card in place. I put the card first then the wire post after. The top of the Trolley is also made form balsa wood. This makes it easy to sand down the edges to create that rounded top. Im pretty happy with it. I used the tips of Toothpicks to create the lights on the front of the trolley. It seemed like the perfect scale. Here you see the trolley top in place. I gently pushed the wood onto the sharp edges of the wire and then took it off, glued the holes and put it back on again. The rounded top was also made from balsa wood, The roof was made from card stock as well. Starting to look completed!! I used the card stock as the wheel base as well. its a nice strong card and worked out perfectly. Ready for paint! Here you can see the trolley getting painted. I started by painting the entire thing black and then added the red on top. I thought this would be the easiest way. Here you see the trolley all painted red with the black interior. Sitting on my finger for scale......so tiny!! Then I painted the orange red color on the seats. The top was made from card stock and colored yellow with marker and then the words were hand drawn with a .005 permanent marker...sooooo difficult. Here you can see the plans for the trolley track. I used my model plan to trace out the track so i could work on it away from the model then put it into place after. Here you can see the track in place on the model from above. The track is made form brass thread wire. Thanks a lot for checking this out!! More posts to come! !